Shotcut - New Version 18.05 Adds Keyframes! New Version 18.05 Adds Keyframes! UPDATE: Version 18.05 has been re-released (build 18.05.08) to fix a new crash bug on Windows and various issues with fade in / out following the new keyframes feature. Version 18.05 is now available for DOWNLOAD! Nearly every filter supports filter trimming (handles on the ends of the clip strip). 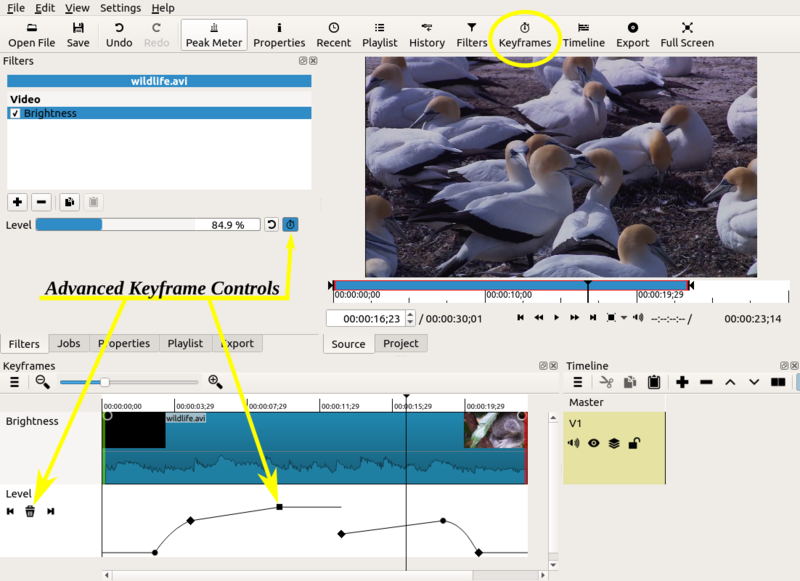 Some filters only support simple keyframes (in/out controls on the clip strip). 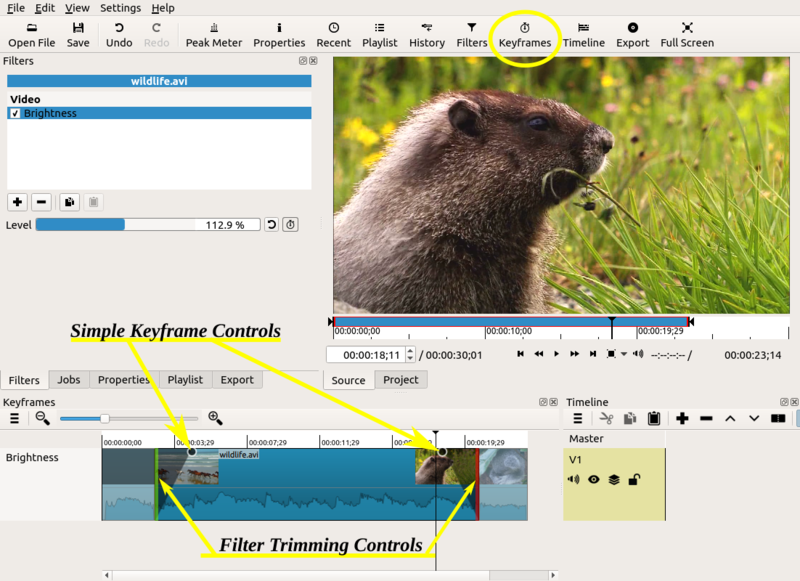 Some filters only support advanced keyframes (rows below the clip strip). Simple and advanced keyframes cannot be used at the same time on a particular instance of a filter. The keyframes cannot be dragged to new positions. You cannot add a keyframe by double-clicking somewhere on its curve. Not all parameters have a curve UI. View > Scopes > Audio Peak Meter and Audio Waveform shows each channel and their layout/order. No automatic mode that chooses the channel count from your first clip. No support in the Balance, Copy Channel, and Pan audio filters (yet). Some audio filters may crash with 6 channels! Not all export formats and audio codecs support surround. AAC and AC-3 are two that come to mind that do. Not every possible channel count and layout are supported (e.g. not 7.1). 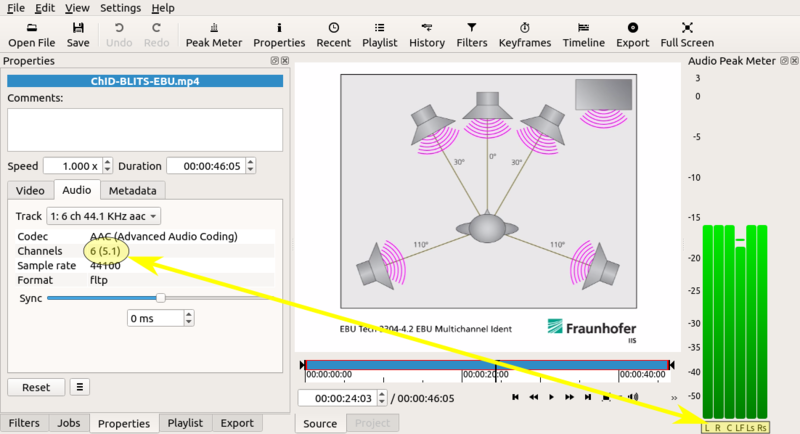 Alternative 6 channel layouts require a FFmpeg “channel_layout” to specified in Export > Other and is not reflected in the audio scopes. Reduced memory footprint (especially for the Rotate and Size and Position filters). Changed default Export settings to reduce output size by increasing GOP and number of B frames.